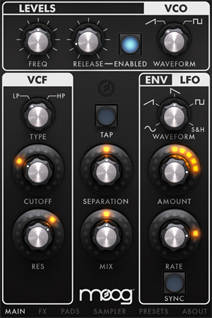 what more can i say about Moog releasing an analog synth module for iOS. its wicked cool. from what it offers it seems to be able to provide a very flexible and feature rich waveform and sound creation platform in your hands. the graphics are accurate to the knobs i used to twiddle when i had my own Moog and Korg synths back in the day. bleep bloop blorp! 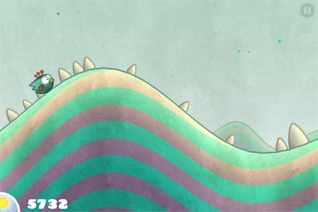 very colorful illustrated platformer w/ a split screen twist. super ingenious gameplay and narrative and challenging too! beautiful soundtrack, procedural graphics change on a daily basis. hop and glide your way along ahead of the sunset to reach each island. happy easter! 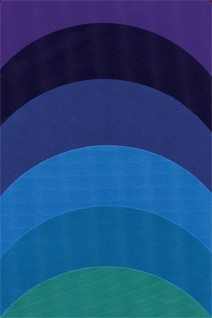 A selection of colorful yet minimalist wallpapers for your various devices and desktops. I'd snag them quick as it looks like its seasonal. Thanks to @bradbarrish for the tip! 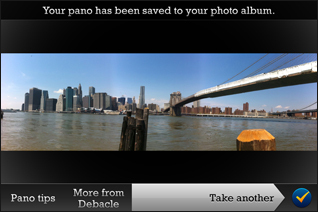 i've made some amazing panoramas w/ this app. the results are stunning. not a fan of serif type vs icons, but, quality of the stitched photos is stellar! 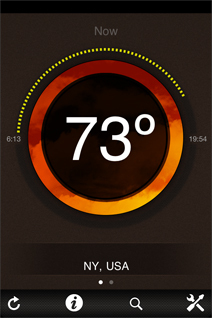 one of the most elegant and simply designed weather apps. its basic circle represents a 24 hour day, then temp in the center in big type, a color band surrounding represent weather conditions. also, includes a nice sunrise/sunset indicator and subtle clock element. you can set mult cities and it DOES have extended forecasting and more detailed weather outlook. one of my top 10 apps used daily. 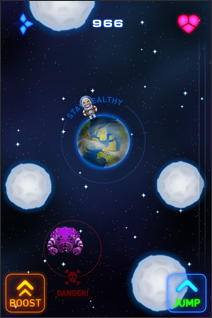 if you are familiar with the iconfactory, then you will be very happy with the design and game play of this spaced out jumping game. its very similar to Above which i wrote about earlier, but, in this case instead of jumping from moving platforms, you are jumping from spinning planetoids and moons, ditching evil aliens and gathering bonus lives and power-ups. 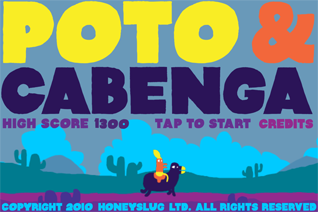 super fun and addictive too! 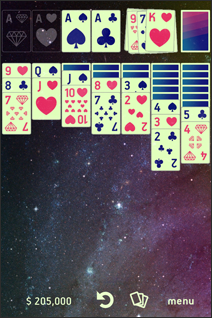 i showed this to my mom who is an avid solitaire gamer and she commented its beautifully designed, but, she would have liked to see more than the standard solitaire game as options. i love that its got parallax scrolling starfields and fab video game mechanics. if they added extra game configurations per mom it would put it over the top! another -awesome- app from local new york developers. thx to @KittiesPlayNice for the tip! 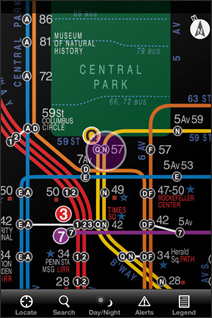 since relocating new york, this app has come in handy when navigating the various subway stops to and from brooklyn. its taken the simplicity of massimo vignellis original design and modernized it to be used w/ gestural interactions. they also have a day/night view w/ changes to subway stop coverage. simple, elegant and colorful and useful to boot! right from local nyc developers! an interesting visualisation for listening to music for an audiophile who wants to review each movement of a piece. you could even teach yourself how to sing music by ear using this! made by a japanese design shop and hence has a very unique method to controlling the music, like a dj does a record. 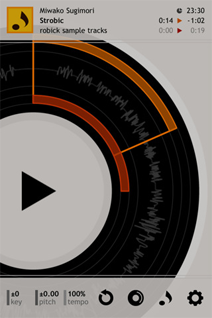 scrubbing the audio file forward/backward is common interaction. very elegantly designed!